1. Cilantro is a natural detoxifier and has a great ability to chelate heavy metals and pull them safely out of the body, you will often see cilantro incorporated into a whole foods or juice cleansing detox regime. Not only does it take out the bad but it also puts back the good due to its high mineral content, in particular iron. 2. 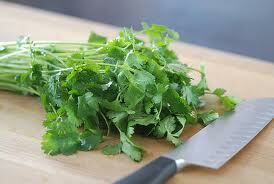 Cilantro can help to lower blood sugar and LDL (bad) cholesterol, great for anyone with diabetes. 3. Cilantro has anti-inflammatory properties that may help with arthritis and other inflammatory conditions, even inflammation due to strenuous exercise. Organic Vegan Dish: Quinoa Salad with Adzuki Beans, Peppers, Cilantro, and a Lemon Flax Oil Dressing. You will often see cilantro added to our dishes to enhance flavour and to increase the overall health benefits of our meals. Another great way to use cilantro is in your fresh green juices. Simply add a handful when making a fresh pressed juice, you will be surprised how much this enhances the flavour! Try growing cilantro in your backyard herb or container garden so you will have an endless supply.